Market yourself and gain an edge in today's job market by learning how to write an effective resume and cover letter. 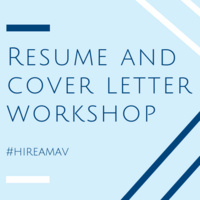 We will discuss components of a resume, potential ways to improve your resume and cover letter; go over proper formatting of resumes; determining what content to include and what to leave out; writing effective accomplishment statements; and cover letters format. We encourage ALL students, student organizations, faculty courses, departments, programs, etc. to attend any of the programs we facilitate on a weekly basis. Please Note: All workshops are first come, first served due to limited seating. NO late arrivals - you are considered late 10 minutes after workshops begin. If you see you may be 10 minutes late, please attend our next Resume and Cover Letter session. They are held every Thursday and Friday at 10 am and 3:30 pm.